Check out the album's first single, "Hard Case," right here. Fifth annual summer outing features guests Blackberry Smoke and Shovels & Rope. U.S. dates kick off in January in Iowa. The Tedeschi Trucks Band have added a series of North American tour dates for 2018, including their yearly performance at the Ryman Auditorium in Nashville. Tedeschi Trucks Band are releasing their second live album,Live from the Fox Oakland, March 17 through Concord/Fantasy. 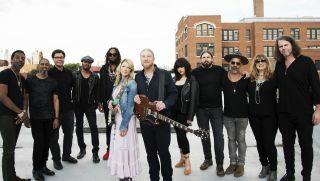 Listen: Tedeschi Trucks Band Premiere New Song, "Part of Me"
Tedeschi Trucks Band — featuring Derek Trucks and Susan Tedeschi — will release a new album, Made Up Mind, August 20 through Sony Masterworks. Husband-and-wife guitarists Derek Trucks and Susan Tedeschi discuss working together on the Tedeschi Trucks Band’s debut album,Revelator.